As Matt Gonzalez leaves the Board this week, his impact will not be measured in legislation passed or speeches given. Rather, from the moment he switched from Democrat to Green during his 2000 runoff election, Gonzalez realigned San Francisco politics in a way that could shape the city for years to come. For all of his political skills, Gonzalez’s personal traits were also critical to his success: he respected those with differing views, refused to divide people into political camps, and provided an ethical model for both activists and politicians. Matt Gonzalez burst on the political scene like a comet and it is hard to believe that he leaves public life (likely temporarily) this week. Most people are likely to remember Gonzalez for his amazing mayoral campaign, while overlooking his role in virtually redefining the city’s political battle lines. Gonzalez entered politics by running against incumbent District Attorney Terrence Hallinan in 1999. He failed to make the runoff, but impressed enough people to become a leading candidate for the District 5 Supervisor’s race in 2000. Gonzalez faced two major candidates in that race, appointed incumbent Juanita Owens and longtime Democratic Party leader Agar Jaicks. Owens was Willie Brown’s candidate, Jaicks was backed by Sue Bierman and other longtime neighborhood leaders, and Gonzalez ran as an outsider who would bring a “new politics” agenda to the city. Gonzalez finished far ahead of the field in the November 2000 election, and was a shoo-in to win the runoff against Owens. But in a shocking development, Gonzalez announced as the runoff campaign began that he was switching to the Green Party. It is a measure of how much Gonzalez changed local perceptions of the Greens that candidates like Ross Mirkarimi can run as a Green in District 5 with his party affiliation becoming almost irrelevant. But November 2000 was a much different time. Gonzalez switched to the Party that many blamed for Bush’s stealing of the 2000 presidential race, and many felt that he risked his election by renouncing the Democratic Party. But this action was typical of Matt. He felt voters should know before the election that he was dissatisfied with the Democrats, and did not want to win by misleading voters. In the December runoff, those who felt Matt had made a grievous political error by the timing of his Party shift were proved wrong. His principled decision became part of his mystique, and he handily defeated Owens to become the first Green elected to the Board. After taking office with other newly elected district supervisors who ran against the so-called Brown machine, Gonzalez became the quintessential anti-politician who gets elected only to realize that his colleagues rhetoric about fundamental change is not matched by actions. Two major issues quickly impacted the new Supervisor. First, in early 2001 Gonzalez waged a valiant effort against approving the city business tax settlement. He was surprised to learn, however, that then Board President Tom Ammiano, the supposed leader of the city’s progressive movement, supported the deal. Daly and Sandoval were the only supervisors who joined Gonzalez in opposing the business tax deal, while the other “reformers” were given progressive cover by the Board President. Gonzalez viewed Ammiano differently after the business tax fight. The dispute led him to realize he would have to forge a new direction for progressives, rather than counting on Ammiano to lead the way. The second issue that greatly impacted Gonzalez in 2001 was the budget fight. Gonzalez had a coveted spot on the committee that reviewed the city budget, and this is where he built his relationship with the Board’s most conservative member, Tony Hall. Gonzalez found himself agreeing more with Hall than with his progressive colleagues, and he soon concluded that most of the Board was not interested in meaningful budget reform. The budget process further disillusioned Gonzalez about Ammiano’s commitment to progressive reform. Since Ammiano controlled eight votes on the Board in 2001, Gonzalez felt that a unique opportunity to meaningfully change the system had been squandered. Gonzalez got his chance to assume greater leadership when he challenged Peskin and Maxwell for the Board Presidency in January 2003. Conservative Tony Hall strongly pushed for Gonzalez, showing the Green Party members ability to build alliances on the Westside. Gonzalez triumphed, with Ammiano voting first for Peskin and then Maxwell. Ammiano did not appreciate Gonzalez’s criticism of him from the left, and these votes further confirmed the split between them. Gonzalez’s ascension to the Board presidency was a striking achievement for a Green in a Democratic town. More striking was that Gonzalez rose to power without cutting deals or hurting his credibility as a principled outsider. But Matt was still a new player on the political scene, and nobody, including himself, saw his Board Presidency as a stepping- stone to the 2003 mayor’s race. 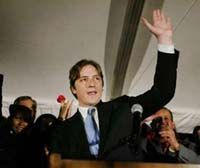 Many believe that beneath Gonzalez’s laid-back artiste demeanor is a ferociously ambitious politician, but I know firsthand that Matt Gonzalez as late as early July 2003 was adamant against running for Mayor. What changed his mind and led him to run? Gonzalez felt by the spring that Tom Ammiano’s campaign was going nowhere and that Angela Alioto could not win. His assessment was that Gavin Newsom was a lock to win unless a new candidate entered the race. Gonzalez was not alone in his assessment. But whereas the city unions and other progressive interests were unwilling to come out and say that Ammiano could not win, Gonzalez saw a train wreck happening and was unwilling to sit by and watch the crash. That’s what known as leadership. After Gonzalez failed to recruit other people to run, the daily “Run, Matt Run” poundings from Chris Daly and others finally convinced the reluctant Gonzalez to enter the mayor’s race. Matt Gonzalez nearly pulled off the most astonishing upset victory in the history of American municipal politics. Gonzalez galvanized the city and forced Gavin Newsom to spend the most money per capita of any mayoral candidate in American history (Newsom’s $8 million of spending does not include the highly publicized visits on his behalf by Bill Clinton and Al Gore, nor the daily pro-Newsom stories and columns in the San Francisco Chronicle). For all of the hype about the young people and newly energized voters who got their start in the Gonzalez campaign, more significant was the active involvement of those not included on the usual list of progressive suspects. This was Gonzalez’s genius. He could win the active support of individuals and groups with whom he disagreed on many issues because they felt he was trustworthy and took positions based on conviction, not expedience. Conviction, not expedience. Matt Gonzalez never cast a vote or took a stand based on campaign donations or some future considerations. By refusing to play this game, Matt lost some support. But this was more than made up for by the many middle-class San Franciscans who aprreciated a candidate not beholden to any special interests. Because he was trusted to make decisions on the merits, groups like the Residential Builders Association actively supported Gonzalez despite his votes against them on many development issues. Conservatives like Myra Kopp also backed Gonzalez, believing that he had the integrity to make fiscally sound budget decisions. The most frequent comment I heard among Westside supporters of Matt is that he was a person of “character.” There’s no higher compliment for a politician, or one less seldom used. Gonzalez broke down the political fault lines that split the city during the Willie Brown years, and reassembled them in a way that could have long term benefit for progressives. The potential power of this new assemblage was seen in the staggering defeat of Prop J last March, and in the heavy losses suffered by Mayor Newsom’s candidates and ballot measures last November. If given the opportunity, Gonzalez could have brokered deals that would have likely led to the passage of both Prop A and Prop K. But he was left out of negotiations regarding the former (the housing bond) until the deal was largely done and ended up signing a ballot argument against the latter (the poorly drafted business tax increase). People knew they could disagree with Gonzalez without fear of retribution, something that was not true under the progressive leadership of Tom Ammiano. Nor did most business leaders and developers see Gonzalez as out to destroy their livelihoods, a fear Ammiano could not overcome in his 1999 race against Mayor Brown. Gonzalez is the first true progressive to make major inroads on the city’s Westside, and his successor, Ross Mirkarimi, also ran well among District 5 conservatives. Mirkarimi shares Gonzalez’s approach of uniting those with divergent views, and also believes in taking a fresh look at city policies, particularly regarding the budget and economic development. There is an old saying that two things can be equally true. We can look forward to Ross Mirkarimi taking office, and also be saddened by Matt Gonzalez’s departure. Did Matt have shortcomings as a politician? Absolutely. He was not good at working his colleagues for votes and was seen by some as inaccessible. He refused to do many of the little things politicians do to curry favor, and was not enamored with spending night after night attending multiple political or neighborhood events. Gonzalez does not have the mentality of a community organizer, and does not think in terms of organization building. Public defenders stand alone before juries and state their case, and Gonzalez brought this limiting approach with him when he entered politics. Ideally, the database for the Gonzalez campaign would have provided a foundation-both financial and from an organizing standpoint-for future progressive campaigns. But if this list of donors, volunteers, and e-mail/phone contacts still exists, it has not been put to use. Matt understood the importance of maintaining this information, but, as typically occurs following an all-out exhausting campaign, it did not happen. Matt Gonzalez destroyed the longstanding view that it takes big money to get elected mayor of San Francisco, and that candidates must modify their progressive stances in order to secure the necessary funds. He defied conventional wisdom in believing he could win with a low-budget campaign, and he was right. Matt’s announcement that he was leaving the Board at the height of his power and influence was a setback for the city’s progressive forces. But his legacy would have been diminished had he spent a second term unmotivated and uninterested in his work. Unlike most politicians, athletes, rock stars, and other celebrities, Matt Gonzalez knew when to leave the arena that brought him fame. Unlike most, he departed at the top.